The San Francisco Public Utilities Commission and several Peninsula cities on Tuesday unveiled construction on 16, $113 million groundwater wells aimed at improving the water supply during a drought or an earthquake. 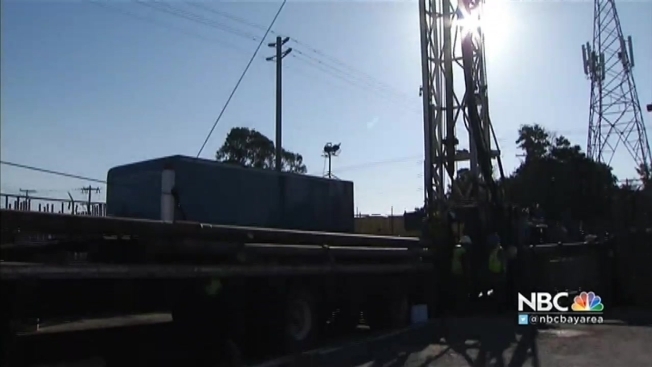 The wells are being constructed in northern San Mateo County and San and made possible through what officials are calling a historic water agreement between the SFPUC, Daly City, San Bruno and the California Water Service Company. The wells in Millbrae are expected to be done in 2017, and the rest of the project in 2018. Steve Ritchie of the SFPUC said during wet years, surface water will be used instead of groundwater, creating a water savings account. Then, during a severe drought or a natural disaster, the groundwater water wells can tap into this groundwater and get more than 7 million gallons of water a day, serving more than 20,000 households. "This has a dual purpose for us," Ritchie said. "A lot of it was driven or designed with drought in mind, but this means we'll have a local supply that we can have here in case there is a disruption to any of our transmission lines. These groundwater wells will be able to function after an earthquake." On Tuesday, timed to coincide just days before the 26th Anniversary of the 1989 Loma Prieta Earthquake, the agencies involved gave a rare, up-close view of the active drill rig. The effort is also part of the $4.8 billion Hetch Hetchy Water System Improvement Program, which consists of 83 projects that will allow emergency water supply to return within 24 hours after a major earthquake on the Calaveras, Hayward and San Andreas faults.